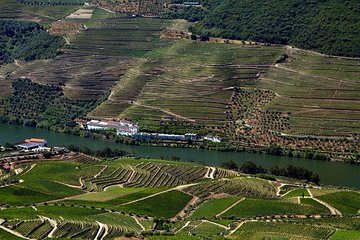 Découvrez ce que la vallée du Douro a de mieux à offrir avec cette excursion œnologique en petit groupe. Passez la journée à admirer la beauté de la région avec ses domaines vinicoles en cascade et son fleuve et dégustez certains des meilleurs vins de la région. Explorez la ville de Régua et savourez un délicieux déjeuner portugais avant de vous rendre à Pinhão pour une croisière relaxante sur le Douro. Couldn't have asked for a more personable guide. Hugo was very familiar with the area having grown up in the area. He offered much personal insight to the geography and culture including the plight of the local vineyards from the storm/landslides the previous day. We certainly would not have wanted to drive the hairpin turns and narrow roads ourselves. Lunch at Anetos and the wine tasting there was very nice. We had the opportunity to chat with the family at the other wine tasting while enjoying the breath-taking views high above the Duoro valley. We enjoyed the river cruise-even got to see eagles flying about and a nest with baby chicks. We highly recommend this trip. After a scenic drive we took the boat cruise down the Douro then drove way up the hills to Quinta do Jalloto winery for more tastings where the wine maker gave us a special treat tasting of his not yet bottled late harvest. So good and we couldn't even buy yet! It was a great day. I highly recommend the Cooltours. Lola is the best!